A magnificent strategy game with adaptable difficulty (4 levels, from family to expert), playable solo, and with equipment.... teeming! 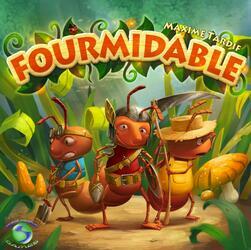 Fourmidable was funded on the Crowdfunding Kickstarter (See the campaign) platform on the 12 December 2015, the campaign lasted 22 days. 953 people helped funded the game, whose the amount requested was CA$10,000.00. Thanks to these 953 people the game could be funded up to CA$60,495.19, ~604.95%.